Cowboy-hat-wearing NFL coach who turned around the struggling Houston Oilers in the mid-to-late 1970s. He also coached the New Orleans Saints from 1981 to 1985 and retired with 86 career wins. 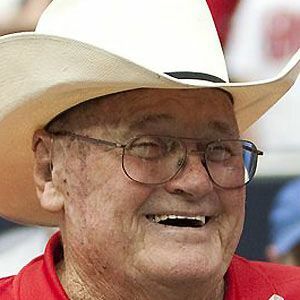 He played college football at both Lamar University and Stephen F. Austin University, although his education was interrupted when he enlisted in the Marine Corps during WWII. He completed his education after the war. He refused to wear his hat in stadiums with roofs, because he was taught not to wear hats indoors as a child. He had six children with his wife Helen. His son Wade Phillips coached the Dallas Cowboys from 2007 to 2010. He was married to his second wife, Debbie, at the time of his death. He worked as an assistant coach under Bear Bryant at Texas A&M University.